PuzzleMad: It's good to have a puzzle friend... Or is it? I have mentioned many times that I love the community associated with puzzling - there is no shortage of people to tell you about new puzzles, to stimulate you to try harder at solving some you are struggling with and also to either give tips or as a last resort, when you are about to rip your last remaining follicles of hair out, to actually tell you what to do so you can finally put a puzzle away! I feel very privileged that I have friends now from all over the world who either write comments on my blog or even contact me via email. In fact every morning when I wake up I have a few emails waiting for me to read from my new friends. Some of these conversations go back and forth by email for months and months and even when the correspondent wonders whether they are taking up too much of my time, I will always say that I cherish every contact. Some discussions have ended up with me receiving puzzles - I got a copy of Jerry's wonderful Ball in cylinder puzzle early to review and loved it. I hope to see the next fruits of his fiendish mind in the next few months. 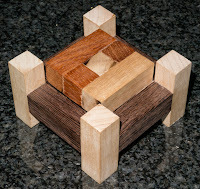 A very prolific puzzle designer has started to teach me how to go about designing my own interlocking and burr puzzles. He has sent me information and Burrtools files to play with and spent considerable time helping me. All this despite a mixup when the design of Kevin's burr was mistakenly ascribed to me! My friend Derek has also spent time conversing about puzzles and has sent me some very special Burrtools files. He has spent time talking about my favourite subject - Puzzles and I am always grateful! 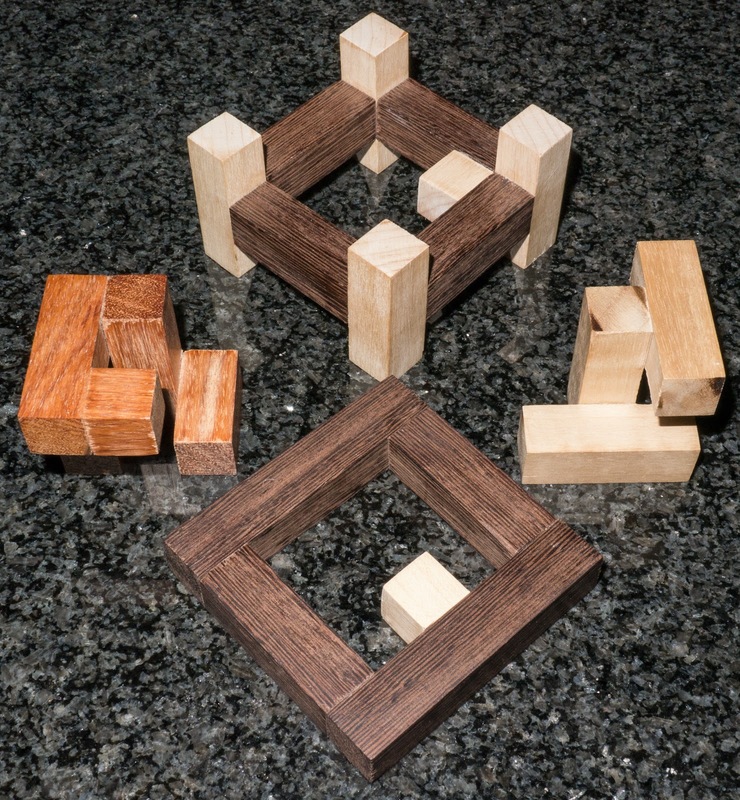 Another puzzler who is far more advanced than me has taken to encouraging me to branch out into actually making my own puzzles and has started by sending me cut sticks and spacer pieces so I can assemble my own puzzles! I have actually mostly managed it too (although sometimes I am not accurate enough the first time and need to do some re-gluing. He has also sent me some fully assembled puzzles from his very own collection just because I expressed delight in a design I had seen on-line. One of these is the Rattle Twist Duo in the picture above. It was entered into the 2012 IPP design competition and immediately caught my fancy. I was really flattered to have it sent to me just because I admired it! 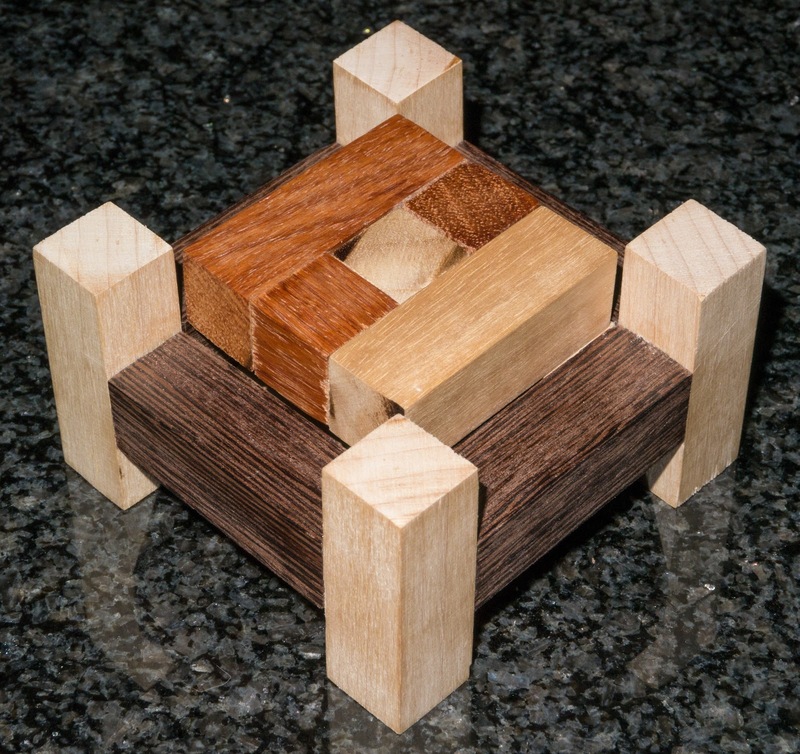 It is 2 puzzles in one consisting of a circular frame into which the other 2 pieces must be fitted. The delight is that there are 2 frames to try! My correspondent protests that he makes very rough and ready work but it is fully functional and still attractive. Did I solve it? Very nice looking close brackets? What do you do with it? Going back to the IPP instructions it tells me to lay these in a flat arrangement such that they all lock together and then there can be no further movement between the pieces and that none can be slid away from the others. Sounds easy? Maybe it is but it took me hours and hours. I really felt pleased with myself when I'd done it and no I'm not going to show you - the answer is on-line if you search but maybe you should make one and try for yourselves! Thanks to this correspondent my puzzle horizons are being broadened enormously and I am very grateful. 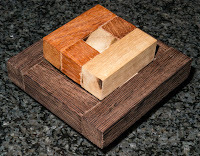 I have bought a pair of absolutely delightful twisty puzzles from another puzzle friend and absolutely adore them. I was mortified when I broke the 4x4x2 by accident and did not want to say anything to him. Eventually it came up in a conversation and again, I was surprised by the generosity of puzzlers when he offered to just make me a new one with no charge. If you ever buy a bespoke twisty puzzle from Hunter then you will be guaranteed quality and great backup. To vouch for the quality watch the video on his 5x5x3 by Rline/Chareaves. I do seem to have more than my fair share of mishaps! Hence the hilarious sequence of emails that ended up with me posting about not being a puzzle breaker. My Shapeways 3x5x7 cuboid is my favourite twisty of all time and I was again horrified to have a piece break on me when I was trying to clean the powder out of it. I have been conversing with the brilliant cuber SuperAntonioVivaldi for over a year now and he is the go-between with the designer. Thanks to him it was arranged for me to be able to print off just the parts I needed. When the pieces arrived, I quickly reassembled it and then scrambled it into the most horrendous scramble I could. Yessss! This was going to be a challenge! Unfortunately during a particular parity algorithm I was distracted by the present wife and made a fatal error! I ended up with 2 pieces poking up where I had never seen them before. Had I realised straight away I could have undone it but only later on did I see my error and I could not for the life of me work out what to do. I had some ideas but wasn't sure - so a conversation with SuperAntonioVivaldi ensued and he used his own puzzle to confirm my thoughts. It took me a total of 5 days to unscramble it from that error. I did work it out myself but was very grateful for the support. What a fantastic puzzle and what a tremendous friend to go out of his way to provide help. All this help from so many puzzlers - they are always a delight to deal with! Or are they???? 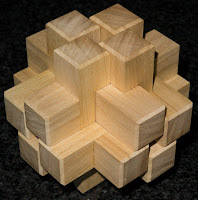 When I was unable to make it to the Dutch cube day due to work commitments, the great Wil Strijbos gave the boys a puzzle to bring back for me - another of his bottle puzzles. The guys have named it something unmentionable due to the (ahem!) visual look of it - it has one of the characteristic red sticks as well as something which looks like the clackers toy from the 1970s. Look it up and use your imagination! I can't show a picture yet because it has not yet been released to the public. I think that one of the guys managed to solve it and the others needed a little peek at a solution. I was so flattered to be given this chance to try something early (Thank you so much Wil!) and have been working on it for a while now. They all taunted me at the last Midlands Puzzle Party that they would bet me £20 if I could open it there and then. Luckily I declined because I would have had to pay them all the money! I have recently found out that there is a sweepstake between them as to whether I will ever solve it with all of them betting against me! So maybe it's not so good to have these puzzle friends!! I am always happy to receive correspondence via the blog comments or via my Contact page. who sends you the sticks? I want some! Can't say - he wants to stay anonymous! I've been looking into bottles recently and I had completely forgotten about your one, thanks for reminding me!!! Will definitely grab(!) one when they come out, haha. I still haven't solved it but I have just had a new idea! And keep in mind your new one will be the first version 2! See everyone! Puzzle friends are everything! I love wooden puzzles like this. It looks like a great challenge to try! Well, I got out the twisties again, and managed to solve the Rex cube 3 times in a row today - good fun. Excellent Joe! It is one of the most rewarding to solve - done mostly by intuition! I'll keep you advised on which twisties to go for!! Curvy copter is coming along nicely. I've nearly finished a non-jumbling solve with just the last four corners to sort out. Then I'll move on to explore the jumbling moves.... Oh, and Twisty Puzzle forum membership has been applied for, although not approved yet . Brilliant! 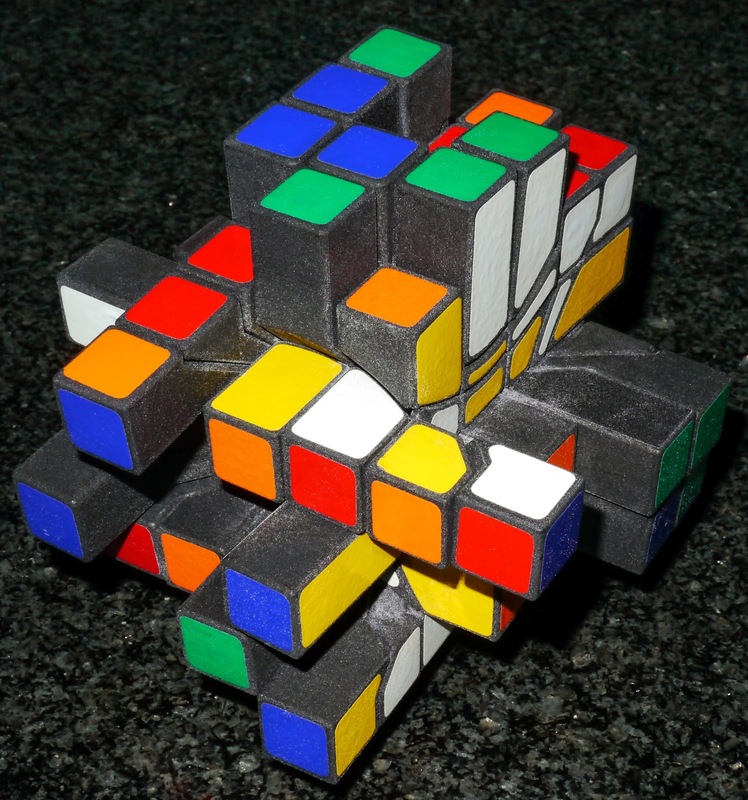 A non-jumbled solve is fun and pretty easy apart from those last corners. NOW - jumble it and be sure to double jumble a good few times. That way you end up with lots of pieces out of orbit. This makes the whole of the top face a fantastic challenge! You'll love it!